Well…the holidays are over and all of the decorations are put away – now what??? My home looked so barren and cold to me once all of my Christmas decorations were put away. All of the rooms felt sparse and my home wasn’t welcoming at all! There’s a part of me that enjoys not being surrounded by so much stuff. A fresh clean slate feels like a new beginning! I guess it is, in a way. But, even though the clean slate has an appeal all its own, I still want (and need) my home to reflect a cozy and welcoming personality. How do I accomplish that? Let me share my easy three step recipe with you! 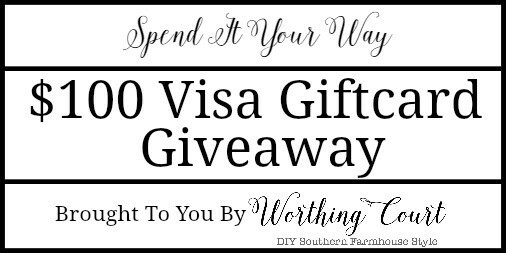 Before we go any further, did you see that a new $100 Visa gift card Reader Appreciation giveaway has started for the month of January? Entry is easy! Simply leave a comment on ANY blog post to automatically be entered. More comments = more entries! Click HERE for details. The first thing that I do is to make sure to generously layer textiles throughout each room. Things like throws, pillows, rugs, draperies, fabric poufs – basically anything made with some kind of fabric or rug material. I can’t emphasize this one enough! Every room that I’ve ever seen, whether monochromatic or full of color, falls flat without the inclusion of textural items. Things like baskets, trays, nubby fabrics, fur throws or pillows, wreaths, plants and on and on. Even things like shelves and artwork add texture. Texture = Dimension = Good! You get what I mean – right? Take a look at what’s outside this time of year. If you take your cues for indoors from what you see outdoors, you can’t go wrong! In my neck of the woods this time of year, the colors of winter are gray skies, barren brown tree branches, brown pinecones, white snow (if we’re lucky!) and the green of pine boughs and cedar trees. 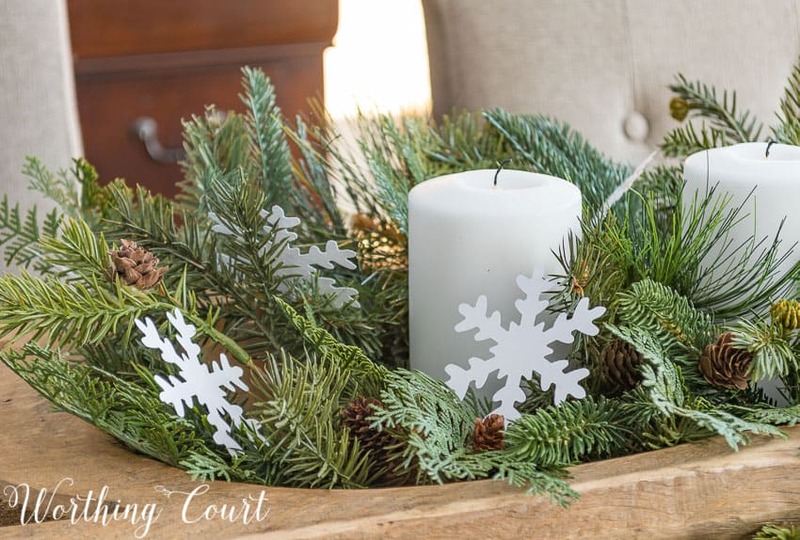 So, I make sure to tuck in lots of faux pine branches and pinecones in all sorts of places, throughout every room. See – easy right? And not quite so hard after all! 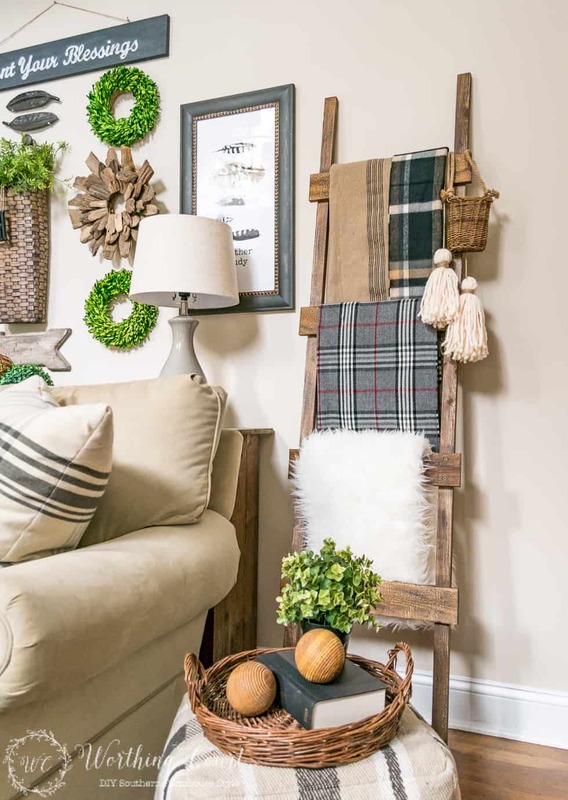 TEXTILES + TEXTURE + NATURE = ONE COZY HOME! « December Recap And January $100 Reader Appreciation Giveaway! suzy, your home is a true source of inspiration….simply beautiful! i especially need help at this time, when all the christmas items are put away and my house looks uninviting-thank you! I absolutely love your style……beautiful style to take you through March! I like all the nature elements you brought in. I need to add some layers to my family room as it is looking a bit bare after the holiday decor. Thanks for the inspiration. Thanks for the tips! It is hard to know how to decorate after taking down Christmas decor. Very classy and besutiful. Thx for sharing your talents! Love the nature component! Thank you. Texture, layering … great advice, as always!! Your blog is so inspiring!! This came to my inbox just in the nick of time. I was looking for some inspiration and here it is! I just made a similar arrangement for my kitchen island. I used my dough bowl too. I added real pine and pine cones from the preserve behind my backyard. I used two frameless white candles and embellished them by wrapping a piece of burlap around the center and added a piece of pine and tied it with some jute. I then used three large faux sparkling snowballs that tied it all together. It turned out pretty cute! I find that many of my “Christmas” decorations can easily transition into “winter” — especially those that are snow-crusted or contain winter greenery. January and February are such dark days here in the north (western PA), that we still need some “cheer” in our decor! Love the layered textures, as well! Cozy up, everyone! 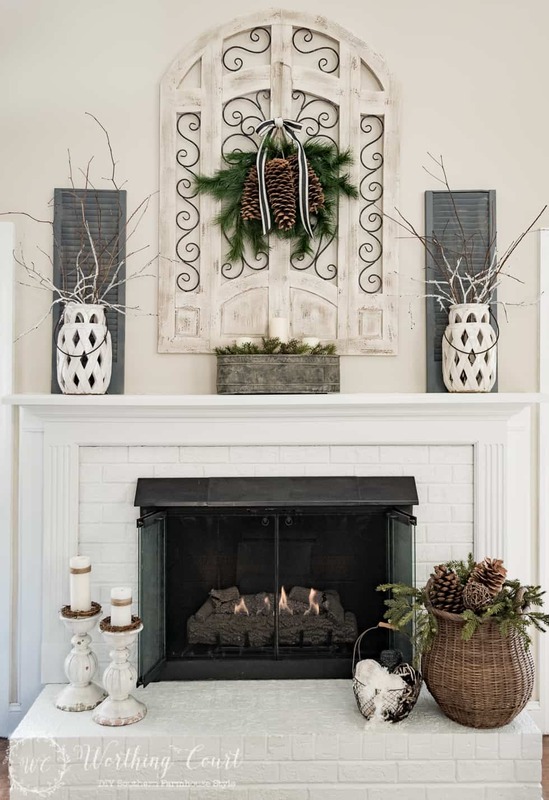 I feel the same way when all decorations are down and also try to incorporate winter colors with a lot of nature inspiration…love your mantel. So needed this inspiration as all the Christmas decorations are put away, now to add greenery back with pinecones and snowflakes! Love the simple but very classic kitchen centerpiece. I feel the same way about needing a clean slate as well as the house feeling empty. That is why I leave my snowmen, a little greenery and snowflakes on display in January. It keeps me happy!! Hi Kay. Without seeing some pictures of your space and knowing exactly what color Sagebrook Sage is, it’s hard for me to say for sure, but it sounds like you have a lot of white that would break all of the green up, so you should be fine. I would lean toward a soft green rather than a bright/intense green. I assume that the beadboard in your dining room covers about 1/2 of the wall, so you would only have green on the top half of the walls in that room. If the two rooms are open to one another, I think using the green in both rooms would be fine. I like the cozy feel in the winter in our Midwest area. Your post is inspiring. I love using fresh greenery from outside. We have some marvelous evergreens with blue berries that smell delicious and stay looking gorgeous when I put them in water. I have them almost in every room right now. Love your blog and great ideas. STILL unpacking from our move 2 weeks ago. Learning how to decorate in the southwest. While I don’t have cedar trees, I do have citrus trees and will do some cuttings and bring that indoors ! I love the coziness of the textures and the mix of colors. Thank-you for the centrepiece idea. I think I may copy. I love your style and the inspiration you provide. Your mantle and fireplace are beautiful. I look forward to your posts each day. I have brought the outdoors in. I have an ironstone white pitcher which I filled with shrubbery greens and red berry stems. I then have a red/green plaid bow on the handle. I also kept my 3 Christmas lanterns and kept the pine trees, faux snow, pine cones, etc. inside them. I’m still in the organize and pack it away stage and yes everything is very bare!! I so look forward to your emails! I love the way your decorate your mantle! I know what you mean by kind of enjoying not having so much stuff around. It seems like from Thanksgiving through the New Year my house is packed to the gills with decorations. And food! We were given so many cookies this year that I had no place to put them all! Putting everything away has left me with a feeling of calm, but I am loving your centerpiece. And as always, your fireplace is gorgeous. Beautiful winter decorating. You are so talented. I like to put out bowls of green and red pears (now in season where I live), and beautiful oranges for a wonderful pop of color on the kitchen island or dining table. 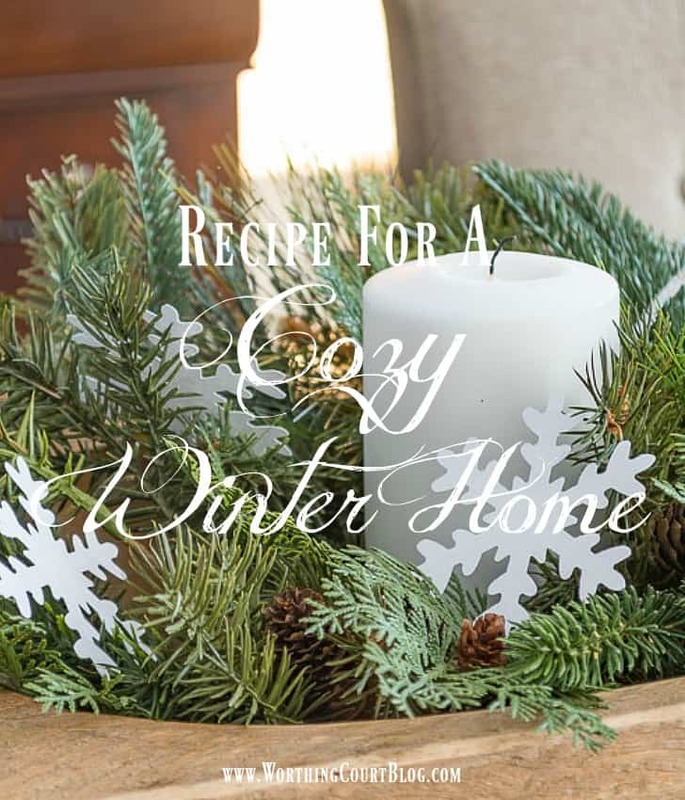 I fill in with a few pine clippings to add a lovely fresh scent as well, Another idea is bowls of citrus or pine scented pot pourri placed in unexpected places, i.e., on the fireplace hearth, a book shelf, or on a side tables in one of the main rooms. Scented candles lit for a short time to lend just a hint of pine or citrus scent is very nice for the senses as well during bleak, gray days of winter.. I always enjoy your posts. I love your style! I could not agree more on your thoughts about our rooms needing different types of textiles. I feel like it is important to decorate all your rooms, not leaving any of them untreated. I love your blog & all y wonderful ideas. Thanks! Moving away from Christmas decor into winter is truly challenging because we are soooo ready for the next season and yet many months away from it. I really appreciate your advice to keep things warm and cozy. Suzy, I really like the way you’ve decorated your table using pinecones in the dough bowl. Your blog today was just what I needed to warm up our home after putting Christmas away. I have a new terrarium so I must get to work decorating it for winter. Thanks for your input. Great post! My living room is very bare and sad looking right now. I am going to have to take your tips and bring in some greens and browns. Thanks! Have always loved your blog. Taking my cue from looking outside my windows, this is the most colorful and best time of the year! The bougainvillea are in spectacular bloom, the light is brighter than ever and the skies are cloudless and brilliant blue! Clue: today we were the only snow-free state out of all 50. No, it isn’t Hawaii, even they had snow-capped mountains today. Guess! You have given us a place to begin with these great ideas. Lovely! Thank you for sharing your ideas. I enjoy your blog very much. Thanks for showing us your table centerpiece. Fall is very exciting and starts the decorating season that goes into Christmas making us feel good. January always seems bare until spring comes maybe because there is no occasion to decorate for like Valentine’s Day or St. Patrick’s Day into Easter. January is so hard to keep moods positive. Right after Christmas is always a letdown! I love your dough bowl centerpiece! I have one and mine does look very similar to yours! Thanks so much for the great ideas. The house does look so bare after the hilodays. Your home always looks so warm and inviting. Such a simple idea but so pretty! Keep your ideas coming! Great ideas-thank you! I love your style and particularly like your mantel area!! Simply beautiful. Hi Suzy! I love all your cozy ideas! They look so warm and inviting! Although, when I look out my windows, I see lots of tropical since I live in sunny South Florida! LOL! But I do try to incorporate white, silver, and gold so that I can keep some things out for January and New Years. Thanks for sharing these tips! So cozy and comfortable- thx for your fresh ideas!